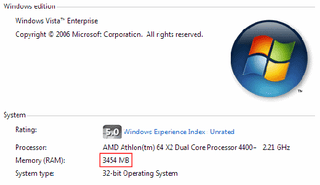 There's a reason why you probably can't use 4GB of RAM on your current machine. No, we don't mean "can't" as in you won't be able to hit this much unless you open up 20 applications at the same time, but more like your machine physically cannot take advantage of 4GB of RAM. Long story short (cutting out the technical details because we've forgotten everything we learned in our computer science lectures), if you're running a 32-bit operating system, you will only be able to address 32-bits of memory at a time. Multiply that out and you get 4GB, but when you take into consideration the memory reserved for video RAM and bios space, you won't be able to hit all 4GB. Point being? Get 3GB and you should do fine. Either that, or get a 64-bit operating system.